Catamount Arts in St. Johnsbury has long been a Northeast Kingdom hub for live performance and film. But for years the organization’s leaders have hoped to deepen and develop its arts education programs. 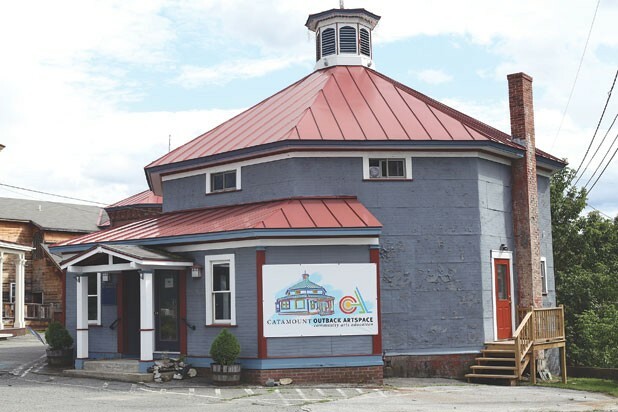 This weekend, thanks to a $103,500 grant from the Canaday Family Charitable Trust and in partnership with the St. Johnsbury Athenaeum, Catamount is opening a new building called Outback Artspace, where it will launch a variety of educational programming. At a grand opening this Saturday, visitors can explore the new space, take free classes — on everything from dancing to drumming to “wearable leaf art” — listen to “Poets on the Porch” and local bands, and nosh on free ice cream. Outback occupies an octagon-shaped house adjacent to the Catamount Arts building on Eastern Avenue. One of three octagonal houses in downtown St. Johnsbury, it was once a carriage house for the horse-drawn hearses that served a funeral home next door. The classes there will be primarily for kindergarteners through eighth graders. Campbell says Catamount has provided arts instruction “off and on over the years, but it was kind of hit or miss.” With the new space, the nonprofit will be able to offer much more. And these aren’t your typical art classes. Programming this fall includes a nature-based storytelling class with the Vermont Center for Circumpolar Studies. Middle school kids will explore the outdoors together and create stories, which they’ll present in an oral storytelling performance. When Catamount surveyed the community about what kinds of classes it wanted, says Campbell, “A lot of people asked for more group music opportunities.” So Outback Artspace is introducing conga-drumming lessons and the chance to participate in an ensemble. High-tech arts will soon be possible, too. SOCAPA, or School of Creative and Performing Arts — which runs camps for teens in New York, Los Angeles and Vermont — recently donated five iMacs and video cameras to Catamount. “We’re thrilled we’re going to be able to offer really cutting-edge filmmaking and animation classes,” Campbell says. Outback has the potential to up the ante for arts education in the region, Campbell says. “We’re here in the Northeast Kingdom with a limited amount of resources and kids who have limited access to artistic opportunities. And the schools are limited now in what they can offer because of cuts. Outback Artspace Grand Opening, Saturday, September 21, 9 a.m. to 7 p.m. Ribbon-cutting ceremony, 11:45 a.m. Catamount Arts, 115 Eastern Avenue, St. Johnsbury. Info, 748-2600.